This true-life story of Abkhazi Garden is far more fascinating than any fiction. It's not a bustling shoulder to shoulder, shove-your-way-through tourist attraction... thankfully! No, the energy hovering over this garden is peaceful and serene. And for that very reason, this 1-acre slice of nirvana pulls flower and garden photographers like hummingbirds to red petals. One-acre Abkhazi Garden is built on glaciated rock. The house is high and peeks out above the trees. I'm surprised that the movie hasn't been made yet. When Peggy met Nicholas would have given When Harry Met Sally a run for the money at the box office. The story is just that romantic. Prince Nicholas Abkhazi was 21. He fled Georgia during the Bolshevik Revolution with his mother in 1919. His ruling father was executed in Georgia in 1923 and in one fell swoop, Nicholas lost both his wealth and his father. A born-in-Shanghai Brit, Peggy Pemberton-Carter met her Prince Charming in Paris in the 1920s. At 18, she was traveling with her adoptive mother. Both her parents had died when she was 3. The two had a lot in common and got to be the best of friends. But when War consumed the world, their relationship was postponed for a very long time. In Shanghai, Peggy was interned in a Japanese POW camp. She chose to take on the job as camp gardener. In a rather twisted way, life was preparing her for the garden she'd eventually leave as her legacy. And so, their liaison faded into a 13 year intermission. There's a lovely lawn with a flower border. Several different irises grow at Abkhazi and here's one clump. While she was a prisoner, Peggy hid her diary and some money orders from her captors. A very lucky - and smart lady - since they weren't discovered! At the end of the war, the money bought her passage to Victoria, Canada where her close friends, the McKenzies, could hardly wait for her arrival. She recovered at her friends' home and planned out her future. She sold her property in Shanghai and bought property in Victoria... the Fairfield Estate. Just a rocky, weed-rich acre of land that begged for Peggy's transformational touch. She didn't waste any time! Soon, the summer house, lawns and fruit trees appeared... and, lo and behold, so did Nicholas! Well, at least a letter arrived from her long lost love. To make the book version a whole lot shorter... they promptly met in New York, became engaged and then married. How's that for crackerjack movie material? For information about the history and garden, visit the Land Conservancy of BC website. Your photos mirror who you are. Be whoever you feel like being. Even if you're a realist, you may like to let loose and play with a photo-editor. Some of my photos look best without a painterly process and they only get a tweak in Camera Raw. I can be a realist when the photo calls for it! But many of my photographs are impressionistic. 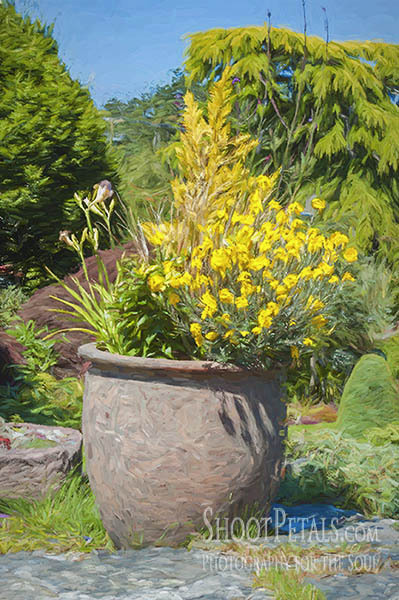 Painterly photos are one way I can play with my images and be creative. It's important to enjoy the process. 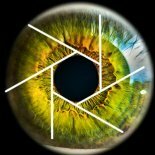 The software I use is Lightroom, Photoshop, and Topaz Impression. Don't be afraid to use an editing program. You computer comes with one and if you grow beyond what it can give you, there are more advanced programmes to choose from. Go through the lessons that come with your photo-editor or search YouTube. The point is to enjoy the process while you learn. 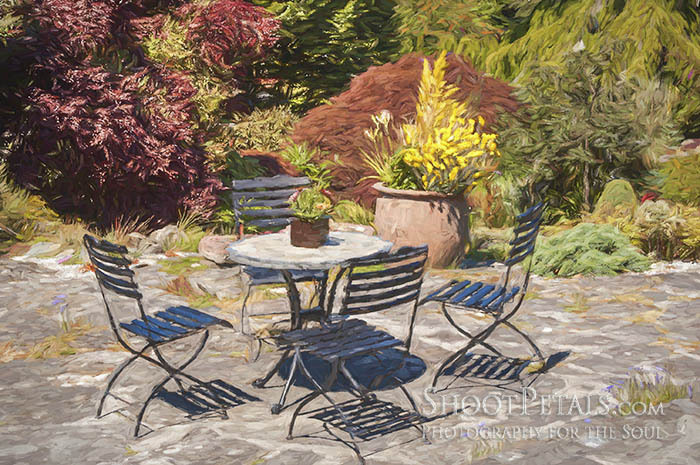 Table and chairs on the patio at Abkhazi Garden, Victoria. I had a delicious lunch and reviewed my photos. Count on having lunch or tea at Abkhazi Garden. This is a table just below where I sat on the patio. A great view of the gardens below and time to review my photos and plan out the rest of the afternoon. I underestimated how much I'd love this garden. And I wished for several more hours to spend there! After I ordered lunch, I walked back down the stone steps and visited the turtles in the pond. It was such a quiet, peaceful day and a surprise in a good way! ... go wild - just be sure to save your original files! The terra cotta planter on the restaurant patio at Abkhazi Garden. I experiment with new photo editing techniques, but mostly I edit making my images into paintings. 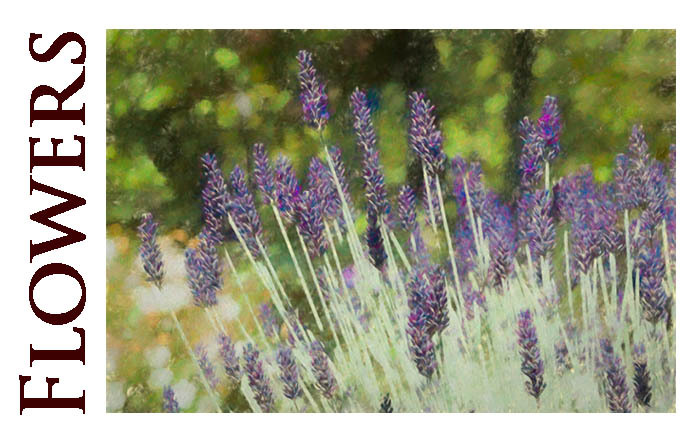 I do that either with Photoshop, adding painterly texture layers. I play with the blending modes for each layer. Every blending mode changes the image. It's a bit of a dance and an experiment. 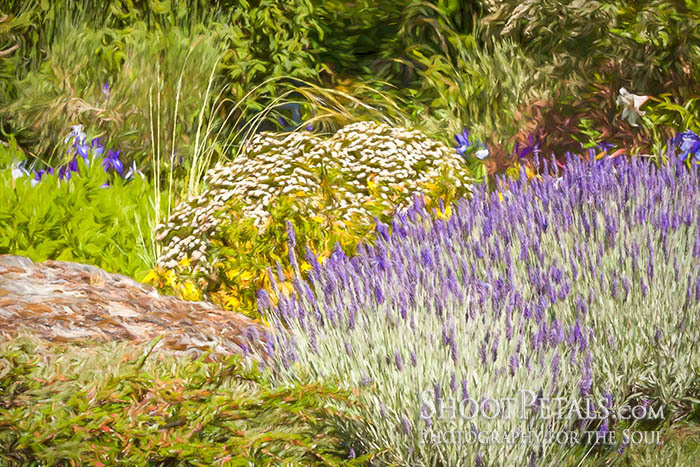 Besides Texture layers, I use Photoshop and the Topaz Impression plug-in. 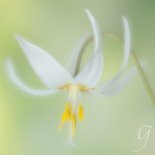 If I use my Lensbaby Velvet 56, the soft, gorgeous focus doesn't need any kind of editing. I love the images that lens produces. This is a photo of the large terracotta planter on the patio, right beside the table where I ate lunch. It's edited in Photoshop and Impression. You can see the same planter in the photo of the patio table and chairs above. English, French or Spanish... no matter. Lavender's essence is luxurious, the blue-purple scented whorls of petals draw bees and other pollinators en masse. It's one of my favourite fragrances as well! 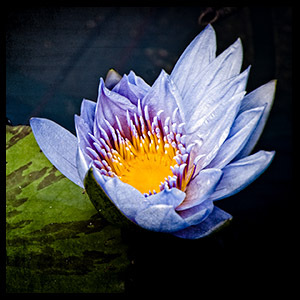 It's not just another pretty petal! There is plenty of the sweet scented lavender growing at Abkhazi Garden. See the irises behind? Lavender doesn't just smell great... it's beautiful and it loves to be photographed. the grasses arching over the white flowers. Need a bit of help with your photography composition? I bet that you shoot most of your photos one way, either horizontal or vertical. That gets a bit boring and it doesn't always show the scene in the best way. We're creatures of habit. We have to train ourselves to turn the camera on it's side and look at life from an entirely new viewpoint. Stone bench at Abkhazi Garden. 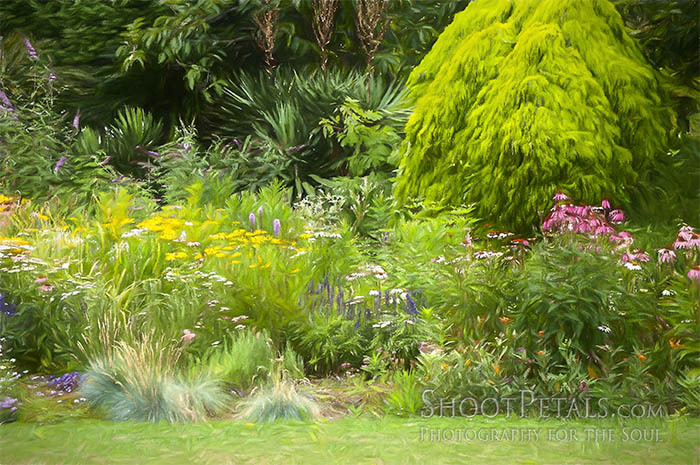 Edited in Topaz Impression, a painterly image. 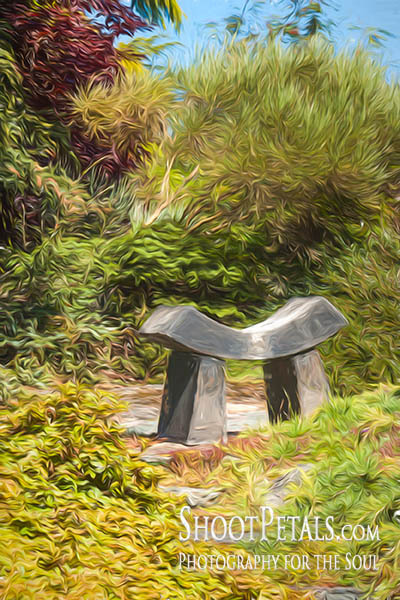 If you take most of your photos with your cell phone, you probably take them vertically like the image of the Abkhazi Garden stone bench above. And videos, too! Videos are much better in horizontal mode. Be aware when you use your mobile camera. Just because it's a phone doesn't mean that you can't get totally amazing photos. All the same rules of photography apply. If you use a DSLR, you most likely have a ton of horizontal pictures like the one below. Try looking at life in vertical. Turn that camera on its side and look at life in a new way! This is why being aware when you're a photographer. One way to stay mindful about everything you're doing is to follow a plan. Here's my Photography Workflow from steps 1 to 7. Try it and adapt it for yourself. For an absorbing read, get Peggy's book ﻿A Curious Cage, published in 1981. She used her journal to write it and recounts detailed experiences as a POW in a Japanese camp. As well, she describes her life in Shanghai around that time. If you love reading about history, get the book on Amazon﻿. Some scenes will just look better one way or the other. In this case, both pictures of the stone bench have good composition... I don't have a preference on that count. I like the red foliage and blue sky better in the vertical photo but the rocks in the corner of the horizontal image are nice. They show the glacier rock terrain that's important to this garden. I placed the bench in the frame using the Rule of Thirds, so it isn't in the centre. If you want your grid to use as a guide, get out your manual and find out how to turn it on. I always use mine but some photographers find them too distracting. 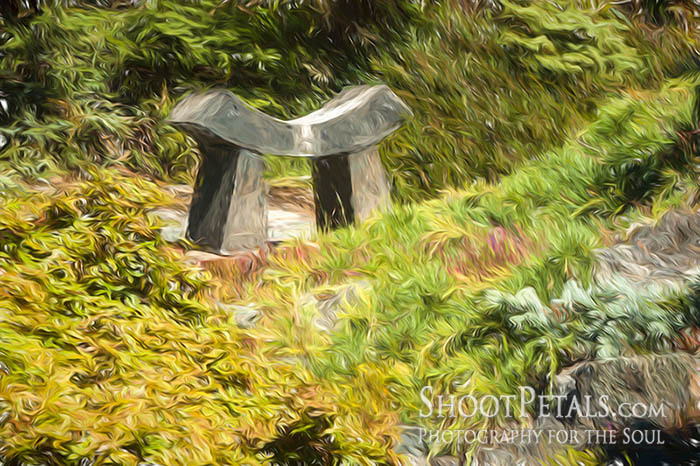 Stone bench on rocky terrain at Abkhazi Garden. A Horizontal view using the rule of thirds. ... Really?! She's complaining about sunshine! The day was gorgeous. Sunny, not a cloud in the sky and 24 C. It can't get any better than that. Photographers always think about high contrast, though. That's because direct sun makes for harsh shadows and blown out highlights. Cameras can't capture the range of brightness that our eyes can. Blown out highlights means that even though you saw a blue sky, it's too bright for your camera's sensor (or the film) and it turns out pure white. You could take your circular polarizer with you and cut down the glare but face it... no fix is as good as a light cloud cover. If you carry some "shade-making" fabric or a sheet of foam board, that can solve the problem for close-up shots of one or a few flowers. But it's a pain to carry all that stuff around and it won't help with landscape photography. So, if you can't come back on a day that has a more even light, just make the most of it and enjoy yourself. 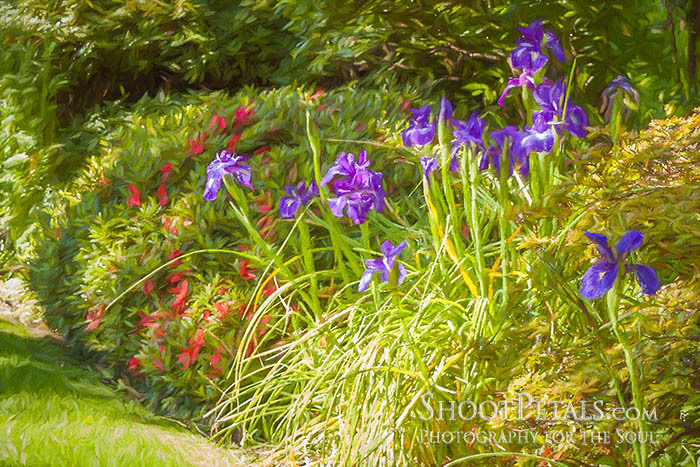 The garden images on this page, or many more beautiful flowers from all around the world are available as prints or note cards. They may not be in the shop but if you'd like an image on this page, let me know which one(s). Browse and find your favourites. Click on the two images below to get to my shop. 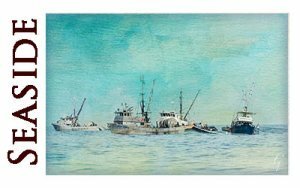 You'll also find lots of lovely impressionist images of the fishing boats, sea shells and our indigenous animal life because I'm lucky enough to live oceanside on Vancouver Island. I'm happy when I know that you appreciate my work. I'd like you to leave me a comment and you can go to the bottom of any page or contact me. It was 1946, a year after Peggy purchased the property, that Prince Nicholas moved to the Fairfield property with his new wife. 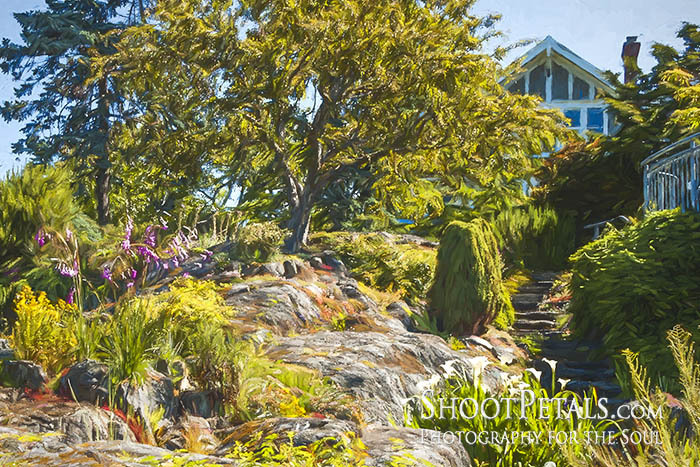 Peggy had set the garden in motion but now, under the care of two loving "parents" and several of Victoria's distinguished horticulturalists, the garden was transformed into a showpiece. It was their sanctuary for the rest of their lives and they lovingly referred to the garden as their "child". Nicholas died in 1987 and Peggy stayed in their home for 2 years after his death. 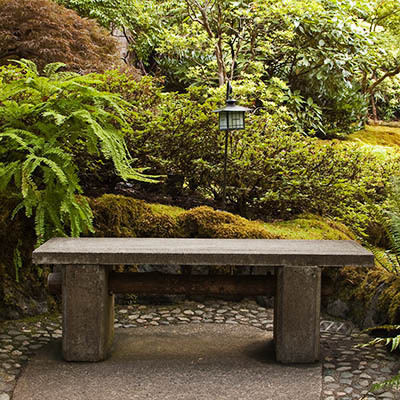 She died in 1994 and beginning in 2000, the Land Conservancy of BC purchased and oversees the garden that love built. 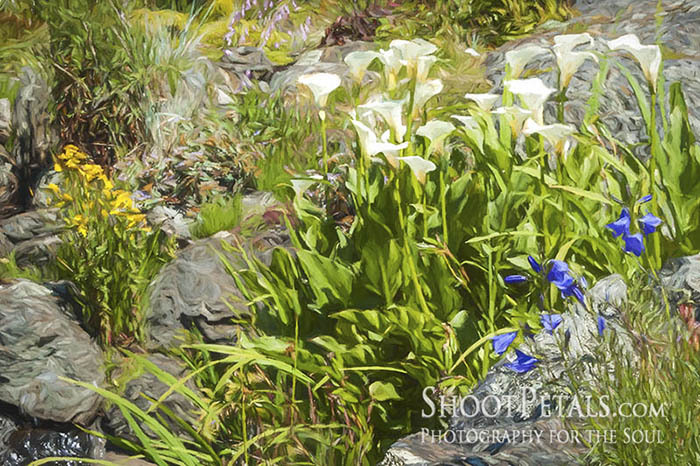 Painterly Calla lilies and other flowers growing by a stream in the rocky terrain at Abkhazi. I visited the garden well after all the rhododendrons were finished blooming and they're said to be spectacular I will get back there one day and I'll make sure to catch the spring blossoms. This garden is a precious gem. Don't miss out if you're in the Victoria area. TLC website gives directions to Abkhazi Garden from downtown Victoria either by car or bus. Abkhazi Garden is a scrumptious choice for afternoon tea or a light lunch... you can eat either inside in the elegant house or outside on the patio. They use locally sourced produce in their menu choices. There are special events throughout the year and bookings are available for weddings and other special events. Look up all the information you need on their teahouse webpage.